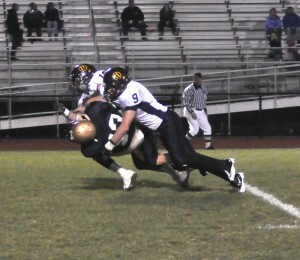 Unionville's Drew Diehl puts a big hit on Sun Valley quarterback Bill Hudson, Friday night. ASTON — It took only a minute and 45 seconds to tell that Unionville had, shall we say, a more motivated week in practice. Mason Popham picked off a Bill Hudson pass on the second play of the game, setting up a Matt Maggitti four-yard touchdown run — and for all intents and purposes, the game was over right then and there, as the Indians cruised to an easy 38-7 win over Sun Valley. A week after head coach Pat Clark cited a weak effort in practice before last week’s tight win over Oxford, a spirited Unionville (4-3, 2-1 in the Ches-Mont American Division) team finally had a dominant effort in the trenches — both on offense and defense, controlling the line of scrimmage. 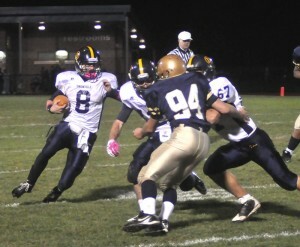 Unionville quarterback Connor Gades looks for running room against Sun Valley. And how. By the time Vanguards even managed to move the ball into Unionville territory, they were down 21-0 in the second quarter. The defense gang tackled and constant pressure forced Hudson to make mistakes — including four interceptions, two by Rich Kaiser, who also scored on a 79-yard kickoff return to start the second half. As usual, quarterback Connor Gades and tail back Mason Popham had strong games, combining for 150 yards on the ground and touchdown runs between them, but the game may well have been the team’s best effort as a group this season. 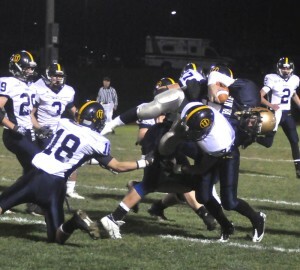 The Unionville defense sends Sun Valley quarterback Bill Hudson airborne, Friday night. Another challenge could be complacency. With three straight games scheduled against struggling programs Great Valley, Octorara and Kennett and then a regular season ending showdown against powerhouse Downingtown East between the Indians and another postseason berth, Clark said he thinks it’s crucial his team maintains week to week focus on the teams they’re playing each week.